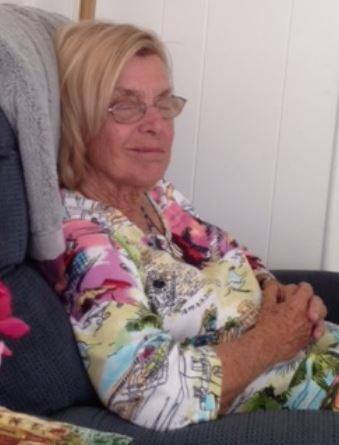 Sally Estabrook has been missing for three days in Julian, authorities report. Photo via SD Sheriff Dept. An expanded search and rescue effort resumed at first light Tuesday for a 75-year-old woman missing from Julian since Saturday afternoon. San Diego County sheriff’s Lt. Mike Munsey said searchers from Orange, San Bernardino and Riverside counties will join locals in scouring the area for Sally Estabrook. Estabrook was last seen around 4 p.m. Saturday at the Pinezanita RV Park and Campround in Julian. The San Diego Union Tribune reported Estabrook disappeared as her husband was taking a shower. Munsey said the search was suspended overnight but would resume at 7 a.m. today. Estabrook suffers from Alzheimer’s disease. She is white, 5 feet 4, 145 pounds with shoulder-length blonde hair. She may be wearing a teal top and white knee-length pants. Sheriff’s officials said she is not very communicative but may respond to her name.